Flooding is causing issues all along the Ottawa River shoreline this week. The media has reported on anecdotal history of other flooding from the past, and perhaps no year was worse in recorded history than 1928. 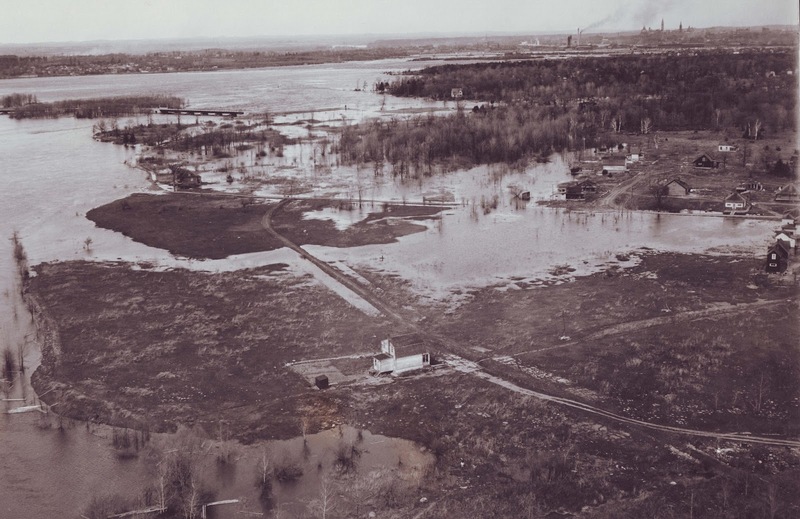 That year severe flooding affected the communities alongside the River, which were then predominantly cottage communities. 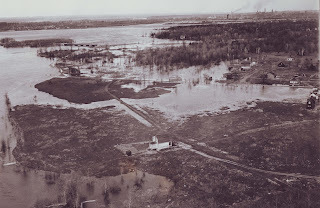 Woodroffe, Westboro, Westboro Beach, Island Park Drive, Riverside Park (aka Champlain Park) were all affected by the floods. This shot is taken just slightly to the east of Westboro Beach, again looking east towards downtown. These are the houses of the Westboro Beach community in behind, the north extension of Churchill Avenue to the water. Champlain Bridge in the background, which was then only a few months old (the first link to Bate Island was opened in September of 1927). Here is more of a close-up of the Champlain Bridge, and you can see the water throughout the Champlain Park community at top right. The bridge access ramp actually goes underwater and disappears, the water is so high! (Note this was the original access ramp/approach; within a year or two, a new approach was built coming more straight off the bridge, rather than the nearly-90 degree angle it went at in 1928). The original access ramp is now actually the parking/lookout area immediately to the east of the Bridge! Fascinating as always...I was wondering if the foundations of any of those houses can still be seen in the Champlain woods.